01 Apr – 15 May: 90 euros for adults and 75 euros for children aged 3 – 9 yrs. 16 May – 15 Sept: 105 euros for adults and 80 euros for children aged 3 – 9 yrs. 16 Sept – 31 Oct: 90 euros for adults and 75 euros for children aged 3 – 9 yrs. Pick-up from a designated meeting point and transfer to the port of Piano di Sorrento. 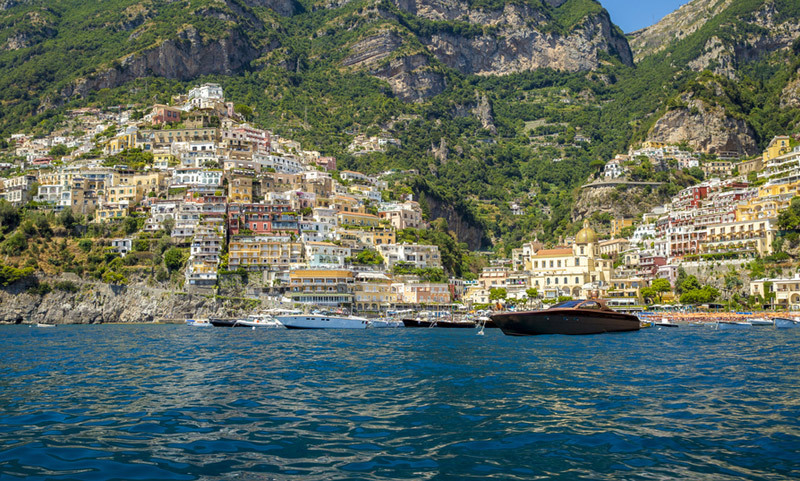 Departure to Capri, sailing along the Sorrento Coast with views of the fishing village of “Marina Grande”, the ruins of a roman villa near “Bagni della Regina Giovanna”, the natural waterfall that flows from the rock, and other interesting attractions along the coast. Arrive at Capri for a boat tour around the island with stops to visit the Marvelous Grotto, the White Grotto, the Green Grotto; along the way you will admire the Natural Arch, the Villa Curzio Malaparte, the Faraglioni rocks and the Lighthouse of Punta Carena. There will be a stop for swimming and snorkeling, and a relaxing break with snacks and drinks offered on board. During the return to Piano di Sorrento there will be limoncello tasting. *The entrance fee of 12.50 euros pp is not included and is paid on site. The program is subject to changes with regard to weather and sea conditions, in which case it may not be possible to make some stops or visits which are included in the program.